Suppliers of parts, materials and services related to Antique Engines. When you order, tell them where you saw their ad! Wanting to buy gas engines in the TRI-STATE area. Illinois, Indiana, Kentucky, Michigan & Ohio. Buying one or all! Auctioning antique engines and antique tractors online & live. Hansen & Young Auctioneers, Inc. CUSTOM GASKETS for any machine. NO minimum order and NO tooling charges for most gaskets. Copper, copper sandwich, crush, asbestos...you name it. Visit our site for a FREE on-line quotation today. For your supply needs of complete tractors, parts and machinery. IHC Collector - Restorer - Machinist - Castings! 321 A East Grand Ave.
Visit www.mecum.com for more information! I'm interested in purchasing unusual engines for my collection. Custom Machining and Fabrication, Making Single Parts is a Specialty, Castings Machined, Steel Wheels Built for Tractors, We will now be supplying water pumps and exhauset elbows for IHC Engines formerly supplied by Don Oberholtzer. PayPal, Checks & Cash only for payments. An informative bi-monthly magazine dedicated to the Oliver enthusiast. Collector & Buyer of old engines, parts, and literature. Always looking to buy odd and unusual engines to add to the collection, especially early aircooleds. Cloth Wire, Ignition Parts, Engine Manuals, Oiler Parts, Fuel Tanks, Packings, Valves, etc. Visit my on line catalog for more! 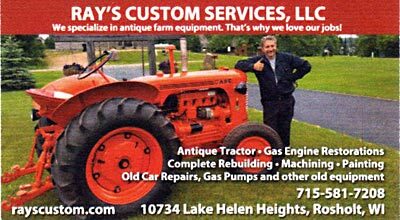 Specializing in Restoration Quality New Parts for Old Tractors - View & Order our 400+ Page Catalog Online! Serious collector of old engines, Side Shaft engines and anything unusual, but I will buy anything. If you have a collection for sale give me a call. Low tension ignition coils, battery boxes, crank guards, fuel tanks and cooling tanks in stock! 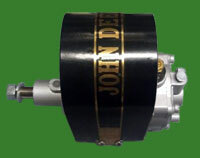 John Deere 1 1/2 HP recycled parts. Heads, gears, flywheels, pullleys etc. Operating from Sarasota, Florida, we are now in our twenty fourth year on the web, hosting the oldest running classified ad web site for antique engine enthusiasts. Our ad pages have delivered millions of ads and we archive over one million related messages from 85,000 registered users with over ten thousand engine photos. In order to keep up with web site demand, we have graduated through a number of hosts and web servers. Our newest web server with SOLID STATE DRIVES is located in Atlanta at a carrier grade, state of the art IBM data center with redundant UPS, air conditioning, generator backup and smoke detection/fire protection systems. The facility is under 24/7 remote camera surveillance and security guard patrol. The server is connected to the Internet through several gigabit Ethernet links from six separate backbone providers, who each run fiber optic cable into the data center through two separate entry points. BUSINESS CARDS: If you would like to reach the antique engine and old iron collecting community with your related products or shows, this page includes cards with a three line text heading and five address text lines including your phone number and your email address. Cost is $150.00 per year, double wides are $250.00. You've probably noticed our new graphic cards and if you want to change to this method, you need to supply your .jpg or .gif card graphic in 400 width and 220 height at 72 d.p.i. cost is $150.00 per year. BANNERS: Our Banner Ads are seen in several pages throughout the EnginAds® and SmokStak® web sites. Choose a prepaid package that includes a BANNER and a text BUSINESS CARD for one year at $450.00. That's $1.23 per day total cost, to lead new customers directly to your business. Enginads is in no way responsible for any sales made on this website from one member to another. Always use caution when dealing with someone you do not know. If we find out that users are misleading or cheating other members they will be banned from our system. Ad limits: Most users generally run up to five ads at any one time. If you feel the need to run more than that, you will have to upgrade to our Subscriber or Sponsor status, which comes in three different levels. Registered = 10 ads maximum, Subscriber = 20 ads maximum, Sponsor A, B, C = higher levels. Sponsor ads are NOT free of charge. Only Sponsors, Banner Ad and Business Card Sponsors are eligible to run FOR SALE ads for commercial products. Ads for ITEMS WANTED, TRADES or EBAY AUCTIONS are free of charge. PERSONAL FOR SALE ads are FREE of charge for yearly sales totalling under $1000. On sales over $1000, a 1/2% (.005 or typically $5.00) commission is appropriate. This request is a tiny fraction of what other auction websites charge, so pitch in! If the site works for you, support it. Checks are welcome mailed to: Harry Matthews - P.O. Box 5612 - Sarasota, FL 34277. Please add $7.00 bank charge to clear international checks. The EnginAds and SmokStak web sites function and survive with financial support by users like you. Published by Harry Matthews © 1995 - 2019.